Best fished in Autumn (August/September) using a floating line and either left static or twitched over the surface. Can be even deadlier when large waves are on the water and the fly being "ripped" through the waves. Takes are fast and furious. The daddy has at times been known to fish well in early June through to August. 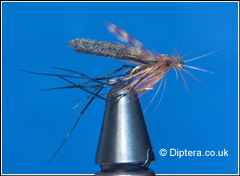 This version of the daddy has a Black Plastazote (Foam) body which aids the fly to float very high in the water.